The Queensport Lighthouse combines a lighthouse and keepers’ dwelling, a popular design for lighthouses in remote areas. The two-storey, wood frame residence is surmounted by a square lantern which is accessible from the second floor of the dwelling. Built in 1936, the lighthouse stands 12.5 metres (41 feet) high and is located on Rook Island, a small island off the shore of Queensport harbour, in Chedebucto Bay. The Queensport Lighthouse is a heritage lighthouse because of its historical, architectural, and community values. The Queensport Lighthouse is a very good example of the efforts by the federal government to make marine navigation safer for coastal communities. The first lighthouse on Rook Island was built in 1882 in response to the booming fishery that operated out of Queensport harbour. In 1936 the fifty-year old lighthouse was replaced with a more modern design. In the 21st century the lighthouse continues to serve fishing vessels as well as recreational boaters. The construction of the Queensport Lighthouse reflected the economic importance of the Atlantic fishery to small communities like Queensport. A lighthouse has supported the Queensport fishing industry since its beginning in the late-19th century. The Queensport Lighthouse is a very good example of a simple and pragmatic lighthouse design. The Queensport Lighthouse is marked by pleasing proportions and a vernacular simplicity of form, which contribute to its picturesque qualities. No additions or major modifications have been made to the lighthouse, allowing it to retain its original aesthetic qualities. 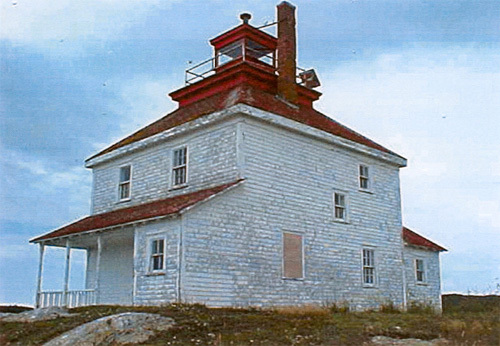 The design of the Queensport Lighthouse, which combines the lighthouse and residence, was a functional adaptation to the harsh conditions found on the coast of Nova Scotia. Its continued use as a lighthouse and home from its construction through to the 1960s speaks to its utility in terms of layout as well as the durability of its materials. The challenging weather conditions of the site and the need for easy access to the light make the combination of lighthouse and residence a very good design choice. The Queensport Lighthouse establishes the maritime and historic character of Chedebucto Bay and nearby Queensport. As the only building on Rook Island, the lighthouse is highly visible from the mainland and all points in the harbour. The Queensport Lighthouse emerges from the horizon and announces its maritime function with its red-and-white colour scheme that vividly contrasts with the blue of the sea and the rocky terrain of Rook Island. The Queensport Lighthouse is highly valued by the local communities of Queensport and the Municipality of the District of Guysborough. The distinctive profile of the lighthouse is used locally as a symbol of the Queensport community. The lighthouse is closely linked to the history of Queensport because many local families had ancestors who were light keepers on Rook Island. There are no related buildings included in the designation.